The FAQ was tooling down Sunset Boulevard, making a detour in the middle of a long freeway drive home, looking to find someplace clean to take a potty break and get a quick snack before a much-anticipated massage later on in the evening. Once inside, little signs indicated that Pazzo Gelato got favorable reviews from LA Weekly and Citysearch, and that they use only organic fruits in their products. A good tip for those of you who are allergic to dairy like me -- gelato places almost always make dairy-free sorbets (or sorbettos if you need to keep in the Italian theme) so you can get dessert like everyone else! Hooray. Humming along to the Talking Heads' "And She Was", I chose a fresh-tasting organic blueberry sorbetto (it had a sign indicating a market price....just like seafood!) joined by a crazy-fluorescent-pink-colored cactus fruit one. The cactus fruit was much better than the blueberry...overall the gelato was decent, but nothing special. 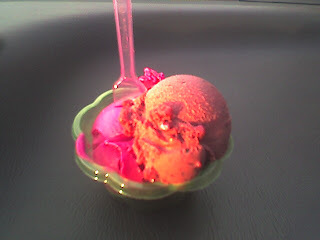 BTW, is it a written law that gelato must always be served in a cute flower-shaped cup? Just wondering. It's a rhetorical question no one needs to answer. The most amazing gelato (also served in a flower-shaped cup) I've had to date is from a little place called Capriccio -- in a Fullerton strip mall if you can believe it. Run by a Korean woman who studied gelato in Italy, her amazingly intense flavors and creamy mouthfeel are my gold standard. The place was packed wall-to-wall with customers the entire time we were there. Anyhow, I digress from my point, which was that sometimes the Universe throws you unexpected little surprises and you should acknowledge and enjoy them. Fresh organic sorbetto instead of french fries cooked in trans fat. It's all good.